Just like humankind, there are many animal species that have developed into astonishing and resourceful planners and builders. They work within their environments to construct shelter for protection, safety, procreation, and survival. These incredible habitats are often built with a rich variety of natural and man-made materials, from twigs and pebbles to bottle-caps and straws. Compass termites build tombstone-shaped mounds parallel to the north/south axis in order to minimize sun exposure and optimize temperature. Edible-nest swiftlets don't even need to gather resources; they build nests out of their very own saliva! These opaque, crescent-shaped nests are harvested commercially and sold for bird's nest soup, a delicacy that is considered an aphrodisiac. Another display of genius comes from the Cyclosa spider, which builds a large decoy spider out of prey debris into its web to scare off predators. 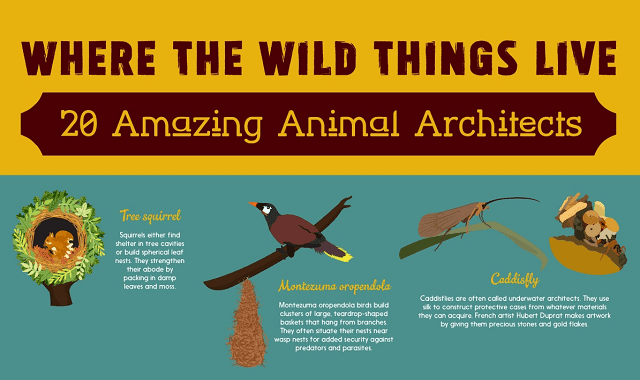 This infographic provides some fascinating insight into the crafty and resilient ways that species across the planet act as architects.